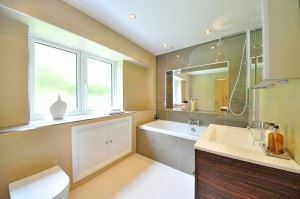 Hiring a designer for your bathroom might seem like an added expense but it is money well spent. If you can work out a detailed plan with your designer to include a timeline, budget and the actual the core, then you’ll be ahead of the game. This plan will become your “map” that you will need to stick to throughout the project. It’s much better than making up things as you go along. It took a lot of effort to get those bathroom pipes where they are. You don’t need to move around the plumbing. Even if you’re knocking out walls to make more space you can still leave all your fixtures right where they are. Rerouting pipes could cost you several thousand dollars. Is it really worth it considering the limited amount of space you have? Many bathroom mirrors are tiny and attached to medicine cabinets. That won’t cut it for your dream bathroom. You can buy a builder grade mirror and surround it with a terrific frame at a fraction of the cost of a huge hanging mirror that you would get at a high-end to interior design store. In a bathroom, the bigger the mirror the better. Upgrading your bathroom might have you thinking about replacing the toilet. But when you get right down to it, a toilet is a toilet. What you can do is replace the seat and lid to your current toilet. Plenty of options that are all standard. A large part of any remodeling project is the demolition. In a bathroom remodel that can involve taking down cabinets, pulling up linoleum and busting up tiles. You could probably do a lot of that work yourself. The only thing you need to account for is how to clean it all up once you’ve created a pile of debris. One call to Junk King Houston gets that job done. They’ll send over a pair of movers and a big truck who can quickly clean up all your demolition debris. That will have the site ready for workers the next day. You could even book Junk King Houston at the end of the project to clean up any remaining construction waste. Count on Junk King Houston to make sure your bathroom remodel project stays clean. This entry was posted in Houston Junk Removal and tagged bathroom remodel, construction debris, demolition, Junk King Houston on June 27, 2017 by Junk King. Last updated June 27, 2017 .